What starts as a simple fantasy premise unfolds into something much more… what it means to be self-aware; to be alive. 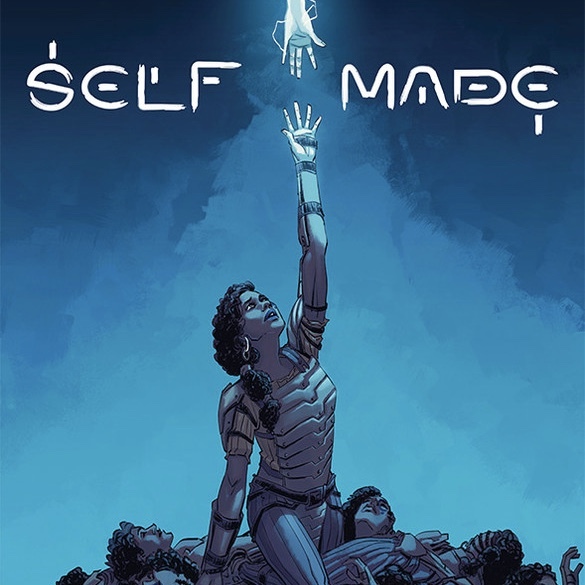 WARNING: This review contains spoilers for Self–Made issues 1-3. The first issue’s cover alone hints at the true nature of the story, but it begins with Amala, a warrior of Arcadia, a kingdom ravaged by a dark invader. Allying with the arrogant prince Brycemere and his mute pyrokenetic companion, she seeks justice, but what she finds shatters her reality. As it turns out, this is a story about a video game NPC that goes against practical programming and exhibits her own will. Rebecca, a game developer and Amala’s misanthropic creator, insists she be allowed to keep and test her curious program, much to the flesh and blood Bryce’s ire and the growing concern of their boss Stuart. This comic and it’s characters seem a bit dull at first, but the more I turn it over in my head the more unique and intriguing it feels. There’s a pull from the idea that this unruly artificial intelligence designed for a game is pushing the bounds of her own reality. I’ve met people like Rebecca, socially stunted and cynical, yet brilliant, making her all the more off-putting. She works for a company, one like most that just wants to make money. While her coworker Bryce and CEO Stuart are painted as villains (the former especially, given his absurdly proud and vindictive temperament,) a fairly solid perspective is given: How are people going to react if they come to believe that the units they murder in a game are essentially alive? And more importantly (though less valuable to these businessmen,) what effect will free$thinking, almost human artificial intelligence have on the world? Stuart compare Rebecca to Dr. Frankenstein in his frantic, angry reprimanding, something I think will really hold water as the story develops. I’m not so convinced that this character realizes how little control she has and thus the gravity of the consequences that will follow her work. In Issue #2, she tests Amala as she has other NPCs, requiring them to either kill her own avatar or be blown apart. Most subjects are implied to have always failed, allowing themselves to be blown apart when immobilized by the suggestion to kill a perfect stranger. This was odd to me, as I’d expect even a programmed personality to take the other option and shoot her in the interest of survival. Was there every any subject that did so? That’s unclear, but overall I started wondering what this kind of test does to the psyche, if any NPCs possess one. Amala, unlike any other before her, simply shoots Rebecca’s hand, disengaging the explosive and intriguing her further. As a sentient human being in a solidified reality (or so I hope!) I found it difficult to understand how this option was never considered by AI. But perhaps the idea is to give a subject two options and see how they behave- in Amala’s case, find a mor savory third option for all parties where both live. I’m reminded of Robin Williams’ protagonist in Bicentenial Man (1999)– the android carves a horse figurine out of driftwood for the young daughter. Her mother insists he must have simply copied the likeness from a photo, while the father discovers that it was purely born from the mind of the android. This realization begins the father’s advocacy for the android to be treated as a sentient mind with free thought. It feels like Rebecca is adopting similar advocacy, but unlike Williams’ kind, pensive Andrew character, Amala seems more dissatisfied. Her motivation was to save her slaughtered kingdom from a deadly magical adversary, yet I’m the end she discovers everything she knows is a lie for the entertainment of complacent masses. The way she is tested and is given barely a moment to ease the mental strain of dismantling her reality makes me think the NPC’s growth as a personality could border on sociopathic. If your reality turns out to be a complete fabrication, the people you love and the place you call home all entirely fake while you are the only true soul within it, would that not hollow your existence? Shatter your being and cause you to ask, “why should I care about anything anymore?” And while there’s the constant display of Amala’s sense of morality in the first issue, the tone of her actions slowly shifts with each chapter. What Rebecca sees as impressive adaptation and a unique chance to experiment, I’m seeing as psychological torture, pushing the limits of empathy and morality. As of Issue #3, she is ousted from the company and, at the order of Stuart and at the hands of Bryce, Amala’s being (her code) all but destroyed. Issue #4 releases in March, but the synopsis and cover art (see below) on Image’s website paints a dark picture of coming events: “Amala has made it to our world—and she is distinctly unimpressed. What’s a girl with a new robot body and some pent-up rage to do? Paint the town red.” I’m personally convinced this means Amala, lacking purpose and shattered by the falsity of her world, is disenfranchised and becomes violent. What I then wonder, is if she begins to murder, with or without realizing there’s no reset on her actions this time around. By this point I’m sure it’s clear that I’m invested in this story and obviously I do recommend it thus far. There’s an unsettling air about it that I haven’t felt since I watched Moon (2009). It’s a flavor I only know to be in science fiction, one where you’re forced to question your entire perception of reality… and then decide how to handle things from there, often with fatal ramifications. In Amala’s case, she’s entering a metallic, consumeristic reality, which perhaps holds a great deal of potential, but my concern is whether she adapts to this newfound existence to pursue happiness or slowly feels more and more trapped and hollow. Self-Made issues #1-3 are available now. #4 is set to release on March 6th and #5 will follow on April 3rd.